50% Off Shopping Day! Many items 1/2 off! 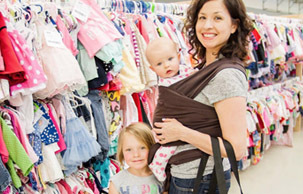 Bring your BFF & shop our huge selection ofchildren's & maternity items at 50-90% off retail!! You’ll find aisles of the best in gently-loved and new items at amazing prices! Check out is easy!! We gladly accept cash, Visa, Mastercard & Debit Cards for payment. Remember BYOB - Bring your own bag to carry out all the great deals you scored at the sale! Thursday, April 4th: Presale Day! Admission for Team Members, Consignors & Community Pre-sale pass holders ONLY. *Passes available for First-time Parents, Teachers, Chlidcare Providers, Foster Families and Military Families. Friday, April 5th: Opening Day! Get your FREE admission coupon here! NEW Items arrived last night! Sunday, April 7th: Half Price Day! PRE-SALE INFORMATION CAN BE FOUND ON OUR CONSIGNOR PAGE! This season we are THRILLED to be BACK at our beautiful venue, The Medford Armory! That I can sell my gently used items and make some money. "I love the people, the concept, merchandise and ease of earning money while finding quality clothes/items at a low cost." Meet fun people make some money on my sons barely used clothes and toys. As a mom of two (quickly!) growing kiddos, I understand how expensive raising a family can be. The need for new clothes, shoes, toys, books, and MORE, is never ending! Hard-working families should be able to provide these items without breaking the bank - that’s where JBF comes in!! With our twice a year, seasonal events, we provide a resource within our community where local families can sell the items their kids no longer use, and also restock their closets and playrooms with quality items for their family at affordable prices. It's a win-win for everyone! Join us at our next event to SHOP, SELL, and SAVE!